When p2p lending service Isepankur opened up to investors from all EU countries five month ago, I started lending there. In this post I continue the series of posts reviewing the development of my loan portfolio. I have deposited 6,000 Euro (approx. 7,800 US$) since starting. The account currently has 126 Euro in cash, 70 Euro waiting in bids on loans to close and 6,550 Euro is invested in loans. 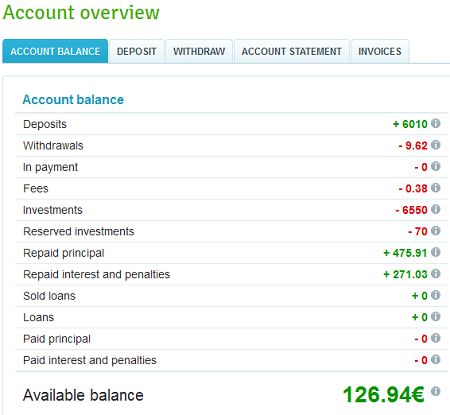 So far I was repaid 476 Euro principal and received 271 Euro interest. My investment is spread out over about 350 loan parts (a bit less loans as sometimes I have 2 or 3 bids in one loan). 5,435 Euro (83%) is invested in top credit grade (“1000”) loans. 780 Euro (12%) in “900” grade loans. And the remainder are experimental bids in “600”-“800” grade loans. 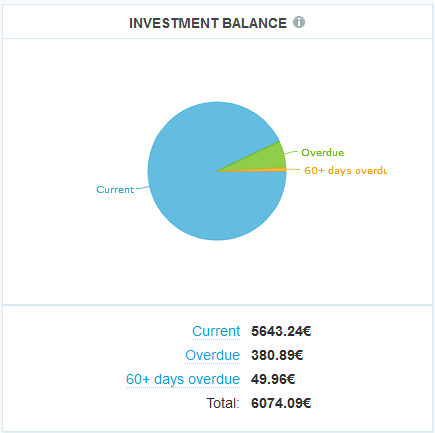 As the above chart shows 3 loans with a total of 50 Euro amount (0.8%) are more than 60 days overdue. Loans in the amount of 380 Euro (6.3%) are overdue. Note that the 380 Euro counts the whole principal of these loans when actually only a fraction of this was due for payment and is in fact overdue. So far everything looks good. Many of the overdue loans pay after a few days and get current again. Even if all 60 days overdue loans would default, that would still be a good deal compared to the interest earned so far. 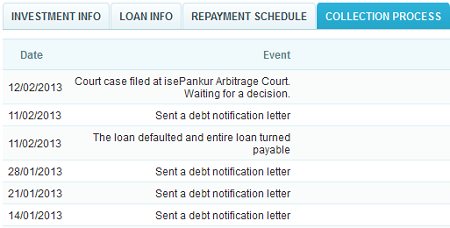 Isepankur is working on the collection of the loans and for the three overdue loans court cases have been filed. I’ll see how that goes. Currently Isepankur shows me a 18.9% ROI. 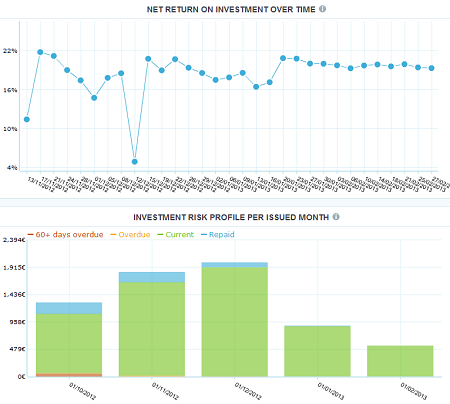 As chart 4 shows the ROI figure hoovered around 19% over the past weeks. In my own calculations, using XIRR in Excel, I currently get a 10.5% ROI. Up to the beginning of January it was no problem to invest my funds fast (compare lower part of chart 4). Since then lender money influx hugely outpaces borrower supply. Due to the structure of bidding mechanism this did not result in sinking interest rates (average interest rate of my successful bids is 26%) but rather in more seldom possibilities to bid. Isepankur reacted to the circumstances by announcing a limit of 500 Euro for the maximum amount any lender may bid on any loan and introducing a lender queue. This has a somewhat British touch to me – I always picture the lines at a bus station. Once my automated bidding profiles made a bid I have to step back to the end of the line and patiently wait my turn to make the next bid. The rationing has led to more equal opportunities but it is still hard to invest more funds. I am currently reinvesting money coming from the repayments. The interface and processes themselves are smooth and so far I am happy with my results. Do you know other investing portals with interest that I can use as a Danish resident? I await verification at isePankur and I have used MyC4 for almost a year now. I have tried to register at different websites but in the end it is not possible for me to be an investor because of my residency and because I only have a Danish bank account. Aside the mentioned ones there are also Zidisha, MyElen and some p2p equity sites that allow investments independent of residency location.